If you have hard water, then you know full well how the minerals in your tap water can build up and stain your sinks and in your shower, not to mention the toilet! No matter what you do, it seems as if those stains are there to stay. 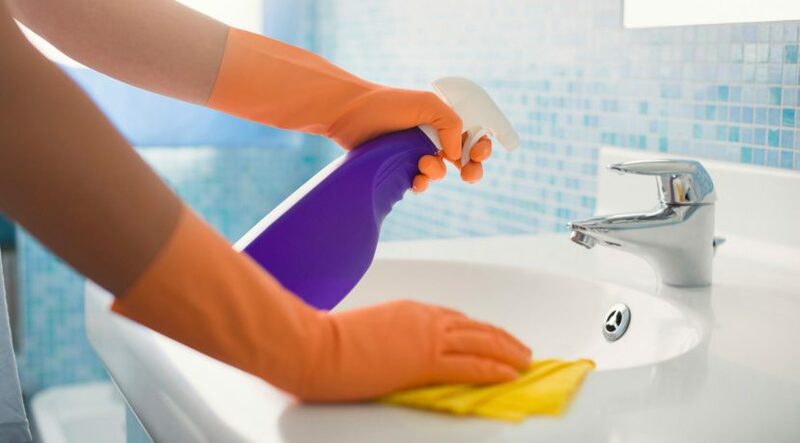 While regular soap and water (and even many bathroom cleaners) can’t even come close to combating these hard water stains, there are ways to handle cleaning mineral deposits in your bathroom and kitchen, leaving your house looking brand new once again. Many kitchen and bath cleaners claim to be able to clear away minerals deposits left in sinks and toilet bowls, and most can. Made from acid-based chemicals, these cleaners can get the job done. But at a price. Abrasives and harsh chemicals scour off stains, but leave scratches and dullness behind. Even bleach can leave a surface looking bland and dull after repeated use. Cleaning mineral deposits in your home does not have to mean destroying your appliances and fixtures. Spray full strength white vinegar directly on the mineral deposit. Keep it damp and let sit for several hours until you see the stain begin to dissolve. For stubborn stains, try mixing a cleaning paste with warm water and baking soda. Rub the paste over the stains and let sit for 10 minutes, and then wipe away with a soft sponge or cloth (never use an abrasive scrubber). If the stain persists, repeat the entire process. Eventually, removing those mineral deposits will get easier, especially if you stay on top of them before they have the chance to soak into your grout and tile. After the vinegar has a chance to work to dissolve the stains, use a standard toilet brush to scrub the grime away. Flush and enjoy your clean toilet! Flush the vinegar from the bowl and refill with fresh water. Get on a pair of gloves and get scrubbing. Do not use the pumice stone without plenty of water already in the bowl. The water stops the pumice from scratching to porcelain. Hard stains may take a bit of scrubbing to clean. If the water becomes cloudy, flush and continue scrubbing. Mineral deposits can be especially difficult to clean from windows since they tend to hide in crevices where they seem to grow. Thankfully, they can be taken care of with a simple solution of vinegar and lemon juice. Begin by filling a spray bottle with white vinegar and a few drops of lemon juice (this will help keep your house smelling fresher). Next, wet the glass with the mixture and wipe away with paper towels. Repeat the procedure if needed. If you gasp every time you open your dishwasher due to unsightly mineral deposit stains, then it may be time to get to work and get rid of them! Building up over time, these stains can make your dishwasher look older than it is; plus it looks nasty. Always clean mineral deposits as soon as you see them: that will keep them from accumulating on the coils or other hard to reach areas, or even rust parts of your dishwasher. Run an empty dishwasher with a cup of tang, white vinegar or orange/lemon juice. These are all natural acids that will eat away the deposits, clear away stains and leave your dishwasher looking cleaner than ever. Buy and use a commercial product specifically designed for cleaning mineral deposits from your dishwasher. There are several brands on the market that work nicely. Check your dishwasher detergent aisle for one. One of the easiest ways to get rid of unsightly mineral deposits throughout your home is to prevent them in the first place. This can be done by filtering the water in your home before it reaches your faucets. Install a home filtration system designed to remove minerals from your water at its source and notice how much easier cleaning your faucets sinks and other appliances suddenly become – plus your drinking water will taste a lot better! Getting rid of those nasty brown mineral stains takes a little work, but the results are well worth the effort. So get yourself some white vinegar, gloves and a few sponges and get to work!